More than 460 pedestrians are treated in an emergency room after traffic accidents every 24 hours across the nation, according to the Centers for Disease Control and Prevention (CDC). This means that every three minutes a pedestrian is injured in an accident. Statistically speaking, someone will die in the United States from a pedestrian-related crash within the next two hours. This means that 4,200 people are killed each year and another 70,000 injured in pedestrian accidents. In 2010, 345 pedestrians lost their lives in Texas, representing 11.5 percent of all traffic-related deaths that year, according to the National Highway Traffic Safety Administration (NHTSA). Of course, Texas is a populous state. Even when that is factored in, Texans have a high rate of pedestrian deaths at 1.37 per 100,000 people. Only 10 states have a higher per capita pedestrian fatality rate. Failing to obey traffic laws – Motorists often fail to yield the right of way to pedestrians even when the law gives the pedestrian the right of way. Distracted driving – Distracted driving is a leading cause of all types of collisions throughout the country, including pedestrian accidents. A motorist who is paying attention to his or her cell phone, for instance, may fail to notice a pedestrian entering a crosswalk. Reckless driving – National statistics indicate that speed is a factor in as many as 1 in 3 traffic accidents. Along with speed, other reckless behaviors such as unsafe passing and failing to yield the right of way are common causes of pedestrian traffic accidents. Alcohol involvement – According to NHTSA, alcohol was involved in 47 percent of all pedestrian traffic fatalities in 2010. In those crashes, the pedestrian was impaired twice as often as the driver of a vehicle. However, impaired drivers are still a common cause of pedestrian traffic deaths. 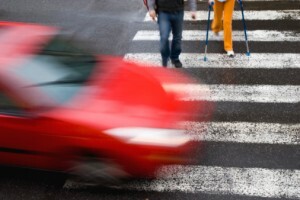 Location – 73 percent of all fatal pedestrian accidents in 2010 occurred in an urban setting. In addition, 79 percent took place somewhere other than at an intersection. Time of day – Not surprisingly, 68 percent of pedestrian deaths take place at night, with 30 percent occurring between 8 p.m. and midnight. Almost half of all deaths occur on Friday, Saturday and Sunday. Gender – In 2010, 69 percent of all pedestrian fatalities were male. The fatality rate for males is more than twice that for females. Age – Both older and younger pedestrians are more at risk for being injured in a crash. Pedestrians age 65 and older accounted for 19 percent of all fatalities and 11 percent of all injuries in 2010. Children under the age of 15 accounted for 7 percent of all fatal pedestrian deaths and 23 percent of all pedestrian traffic accident injuries that same year. Almost 1 in 5 children killed in a traffic-related collision that year was a pedestrian. Back and spinal cord injuries, including those that cause paralysis. Internal injuries, including internal bleeding. If you or a loved one has suffered catastrophic injuries in a pedestrian accident in Houston or elsewhere in Southeast Texas, contact Kevin Krist today for a free consultation about your case. Simply call the Law Office of Kevin Krist at 281-677-3960, or use the firm’s online form. Let Kevin Krist explain how he can put his personal, proven experience to work for you, so you can get the compensation you deserve as a Texas accident victim. Kevin Krist represents personal injury victims on a contingency fee basis, which means you pay no fees unless he recovers compensation on your claim.